In Iceland where icebergs and volcanoes reach high up into the sky, where hot springs and waterfalls face rough lava deserts, still exists a genuine notion of adventure. These are the highlights of the expedition. 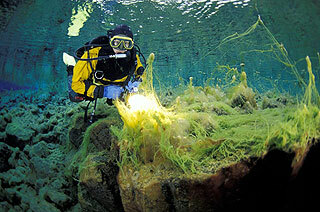 Silfra, the most impressive dive spot in Iceland. Exposed and completely surrounded by deep-blue water, I am unable to believe what I see. This true sensation of a weightless body, surrounded by this endlessly visibility, makes me feel confused. I'm really overwhelmed by the air-like quality of these waters situated between two continents, being Iceland's largest natural lake, the Thingvallavatn. Huge fissures filled with crystal clear water that flows into the lake are without doubt the most impressive spot called "Silfra", 35m high steep walls, countless tunnels and caves. The emerged clear water has a year-round temperature of 2-3°C. The Westman Islands have to be considered as an insider tip during summer - the season of the octopus. Here along the southern coast of Iceland, many islands or bits of volcanic rocks can be seen as being the result of eruptions of now extinguished volcanoes. A truly unique diving experience is a silicate thermal chimney that has grown over the last 11000 years up to a gigantic tower in the Eyjafjördur, between Hrisey and Akureyri. The active hydrothermal vent is called "Strytan"; it rises from 70m depth up to 15m below the sea surface. Anemones, sea squirts and mussels decorate this richly covered thermal chimney that is rising like a needle out of the depths of the fjord. The highlight of our expedition was a dive into the unknown, right in the heart of a sleeping volcano - the Askja, a gigantic caldera. 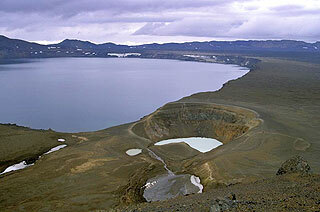 As a result of its last eruption in 1875 the ground next to the vent gave way and slowly filled with water, thus creating the lake Öskjuvatn; with its 220m, Iceland's deepest lake. Underwater the ground is covered with fields of green and yellow algae and bubbles rising out of the organically slimy bottom soil. Icelandic waters make it possible not only to dream about exploring new grounds and embarking on an adventure, but also make it actually alive.